The orchestra piece Fünf Stücke um den Fluss zu queren (2012) has been selected by the International Jury of the ISCM World Music Days in Tongyeong / South Corea 2016. It will have its Asian Premiere at 28th March 2016 in the Opening Concert of the Festival in the Tongyeong Concert Hall. The Orchestra Ensemble Kanazawa is playing with Christopher Lee as conductor. The pieces has been written in 2012 as a commission work of Neue Musik in St. Martin and has had its World Premiere within the accompanying program of the documenta XIII in Kassel / Germany. At the International Womans’ Day at 8th March 2016 the British BBC Radio 3 is featuring the orchestra piece Language of Leaving (2012/13) which has hads its World Premiere at the BBC Proms in 2013. Catriona Young presents the piece again within the feature Through the Night (0.30h). The musicians are the BBC Symphony Orchestra London, the BBC Singers and the conductor Josep Pons. Running Circles (2011) for two pianos and two percussions will be heard the first time in the USA. The Ensemble BerlinPianoPercussion presents the piece at 5th April 2016 in Charlotteville / Virginia und at 8th April 2016 in Miami / Florida. The musicians are Ya-Ou Xie and Sawami Kiyoshi, pianos, and Adam Weisman and Matthias Buchheim, percussion. The pieces is presented as well at the new CD of the ensemble, Architecture of Time (telos music). In 2016 Charlotte Seither will be again jury member of the German Academy Villa Massimo in Rome. Besides she has been nominated for the Bogliasco Foundation Advisory Committee of Europe (FUC EU) in Italy. Under the president Salvatore Sciarrino she will be jury member in the International Composition Competition Nuovo Orfeo in Italy, which takes place in cooperation with the Orchestra di Padova e del Veneto. Charlotte Seither has been guest at the New Music Indaba Festival 2015 in Bloemfontein. The South African New Musik Ensemble was playing several chamber music pieces. Besides, her piano piece Ask him! had its World Premiere at 19th July 2015 in Johannesburg. In cooperation with the Goethe-Institute Johannesburg she did a lecture about her works at the WITS University (21st July), combined with a master class for young composers (26th July). Concerts and lecture were accompanying a three-weeks-residency at the ArtLab Johannesburg which was supported by the Sylt Foundation. In 2015 Charlotte Seither was jury member of the German Academy Villa Massimo in Rome. Besides she was member of the jury of the Fanny-Mendelssohn-Competition in Vienna, of the Music Prize of the County Sachsen-Anhalt, of the Berlin Senat for the Research Scholarships in 2015, of the Competition of the Tonkuenstlerverband Sachsen-Anhalt for Young Composers, of the National Jury of the German Composers’ League for the European Composers and Songwriters Alliance (ECSA) and of the jury of the GEMA for the Deutscher Musikautorenpreis 2016. Charlotte Seither has been awarded with the Deutscher Musikautorenpreis 2014 / Category Contemporary Choir Music. The celebrity was given at the 8th May in the Ritz-Carlton Hotel in Berlin. The prize was awarded in 9 categories, e.g. in Jazz, Electro, Pop and Film Music. 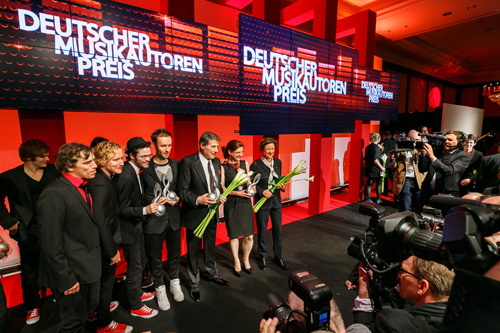 Under the prize winners you could find the Sportfreunde Stiller (Most Sucessful Work), Udo Juergens (Live Award) and Charlotte Seither (Contemporary Choir Music). Here you can subscribe to the monthly online-newsletter with information about the current concerts. Samuel Tramin, Charlotte Seither u.a. darin: Botschaften aus dem Turm. Sergej Newski, Charlotte Seither u.a. in Kooperation mit Atonale e.V. Helmut Zapf, Mayako Kubo, Charlotte Seither u.a.